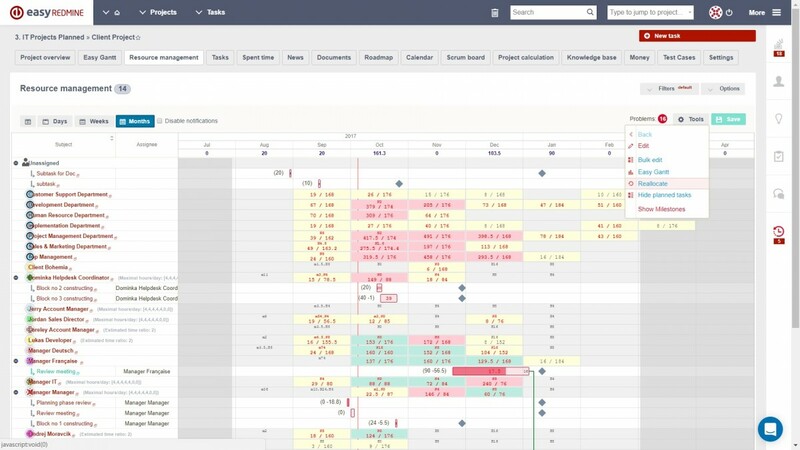 Visual resource planning across projects. Drag & drop workload balancing. Work allocations by projects, with statistics, competence management, and attendance. Easy resources view across all projects. More than 20.000 users. Resources - allocated & balanced. 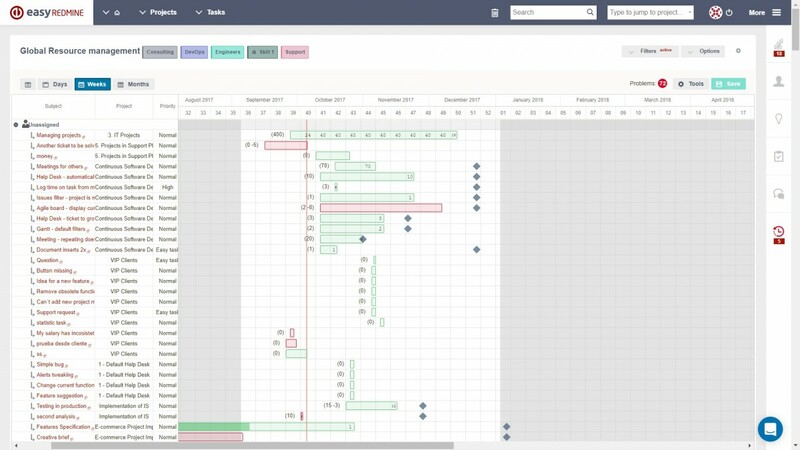 The uniqueness of this Redmine Resource management plugin by Easy is in visual planning across the projects with regard to real-time capacities and competencies of workers and drag & drop user interface. 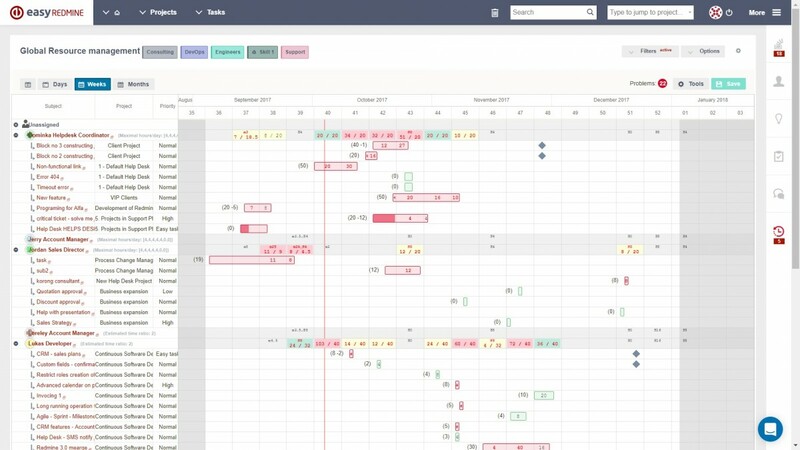 Managers save time thanks to an easy-to-use work planning. All the work is optimally planned and workload of the people is balanced. Managers are well aware of people's workload. The Resource management dashboard gives you an excellent global view of your workers and issues that have not been assigned yet. For each user you will be able to the assigned issues and whether that worker is over- or underloaded. 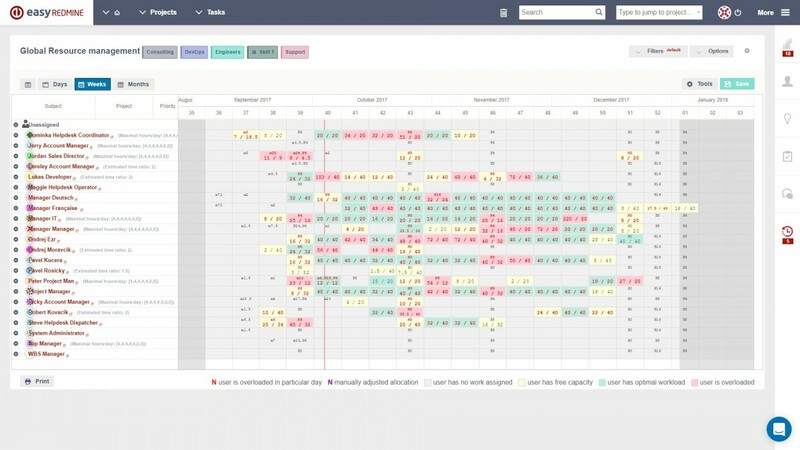 Using Drag & Drop you can easily change the start and due dates of issues to balance out the workload, allocate unassigned issues or reassign a issue to a different worker. Newly in 2018 version: It is now possible to filter issues in Resource management according to fields of their project. This is especially useful in global Resource management. Effective allocation of your worker's expertise is crucial good resource management. Using Redmine Resource management plugin, you can easily create filters that will help you with your competence management, which can be seen in the header. Simply choose the competence and the users and a quick filter will appear on your dashboard, that can be switched on and off when needed. Newly in 2018 version: Better color distinction - in some cases there was red text on a red background in the previous versions so the color distinctions were made looking clearer. When using global Resource management, you can easily switch on the versions in the panel below the chart. This way you can keep up with the dates of your issues' versions while managing resources. Newly in 2018 version: The free capacity of the group is calculated from issues assigned to the group AND issues assigned to the members of the groups - previously it only worked with issues directly assigned to a group. Thanks to the project function within the Global Resource management, you can easily navigate through users issues. Projects button will allow showing which project each issuebar belongs to, thus simplifying the process of distributing the workload. Newly in 2018 version: Restriction in moving a issue with "following" relations was added - Resource management doesn't show issue relations (as regular Gantt). So without the proper context, you may move a issue into the future, which also moves a whole set of issues that follow it. Now, Resource management shows barriers where you cannot move the issue without affecting other issues. Resource management shows only tasks that have start and due date in the selected period. As a result, some tasks that are allocated in the selected period were hidden from view. Resource management shows all tasks that have some hours allocated in the selected period. The total allocation has been displaying incorrectly when opened in detail. Number in the Problems list were showing to many digits after the decimal point. Warning is not shown on task, with zero allocated hours on the overloaded day. Tasks and folders icons only flashed when different tools were used and did not display correctly in the Resource management view. Resource management - Disabled possibility to create reservation for "unassigned"